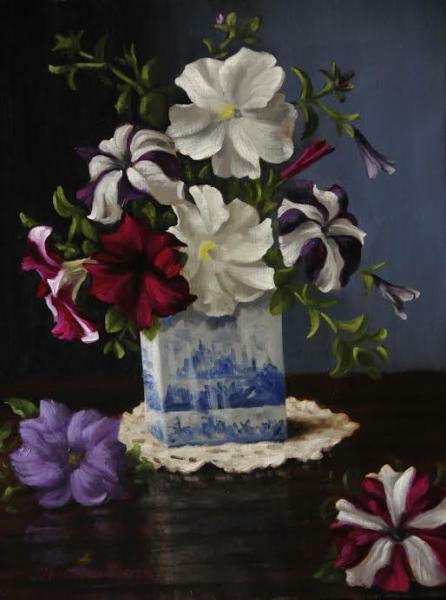 Christopher Pierce is a nationally recognized fine artist who paints florals, still lifes, portraits, figures and interiors with panache and a mature sensitivity. Along with his stunning portraiture, he is well known for the huge and commanding florals that come from the bounty of his gardens. His colors are ground in the traditions of the old masters, a tradition which helps infuse his work with a timeless quality. In a year marked by rising national acclaim, a special solo exhibition of 84 of Pierce's paintings was held in the main gallery of the National Arts Club this past January. And his painting, "Alex: Homage to Sargent and Tuke" was chosen as a finalist in The Artist's Magazine's annual national competition in the Portrait/Figure category. In 2009, “Studios” magazine featured a 7 page article on Pierce's impressive studio in Shushan, NY; and his painting “Wingback” won honorable mention in the National Arts Club's annual 110th Annual Exhibiting Artist Members' Exhibition. 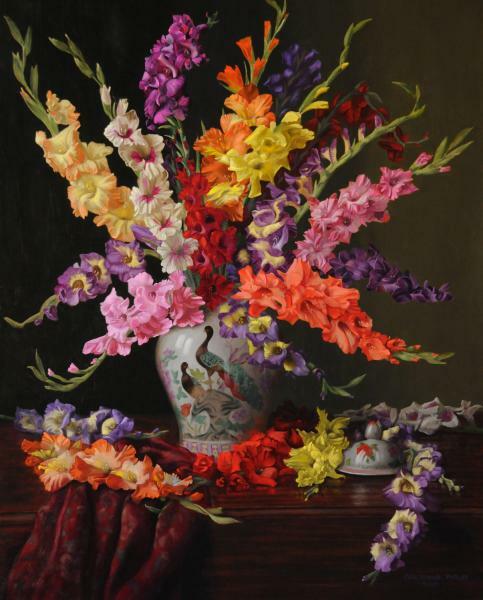 In 2008 his painting Sunflowers and Peacock Vase” won the Helen DeCozen award for a floral at the American Artists Professional League Grand National Exhibition in New York City. And also that year he won the “Visual Arts Program” award in the National Arts Club Online Exhibition. In 2006, his portrait “The Gardener” won First Prize at the Connecticut Society of Portrait Artists annual competition. His work also won the “Visual Arts Award” at the National Arts Club 2006 online exhibition, and the “Frank C. Wright Award” at the Hudson Valley Art Association . Pierce continues to attract interest for his deliberate and exquisite style of artistry. He has been elected to the internationally known National Arts Club in New York City, and is also a member of the prestigious Salmagundi Club . Pierce, who was the cover artist and featured oil painter in the May 1999 issue of American Artist magazine , was also a featured oil painter in the February/March 2001, and August/September 2002 issues of International Artist magazine . He was also a finalist in The Artists Magazine 's 2000 Art Competition. His landscapes, figures, and floral still lifes have been featured in Adirondack Life magazine and New York Art Review. Pierce has won several other national awards, including Best of Show at the Old Forge Adirondack Annual; the Director's Award at the Oil Painters of America in San Antonio, Texas; the CAAP memorial award at the American Artists Professional League in New York City; and Best Traditional Oil at the Annual Salmagundi Members Show. He has also won First Prize at the North Country Council of the Arts annual exhibition. Pierce is also a member of the American Artists Professional League, Audubon Artists, and the Hudson Valley Art Association.